How do you organize an occupation? If you’ve been following the news from Ukraine, you may have noticed that there’s still a massive mobilization going on. It has been three weeks since the early protesters came onto the square, asking Yanukovych not to sell out Ukraine to Russia and claiming that Ukraine is Europe. Since then — and since Yanukovych’s decision not to sign an association agreement with the EU and his leap into bed with Putin — protesters are asking for Yanukovych’s resignation, as well as those of his ministers. Some people support the United Opposition bloc (made up of three parties and their leaders: UDAR (Vitaliy Klitschko), Batkivshchyna (now, Arseniy Yatsenyuk, but this is the party of Yulia Tymoshenko), and Svoboda (Oleh Tyahnybok)) gaining power; this would likely happen through early presidential elections. Others are willing to watch Yanukovych dig his own grave and wait until 2015 to vote him out of office through regularly scheduled elections. Still others don’t really want any of the current political leaders to gain or remain in power, but whether they have other suggestions is yet to be seen. The protests surrounding these political questions have taken the form of a massive occupation of Maidan Nezalezhnosti, the central square of Kyiv (and yes, this is reminiscent of and inspired by the Orange Revolution of 2004, which happened in a similar style). The occupation was cleared once when the Berkut (riot police) used truly excessive force in the early morning of November 30th, beating sleeping protesters to get them to leave the square. However, the square was quickly re-occupied, much to the dismay of Yanukovych, who ordered a second clearing of the occupation. 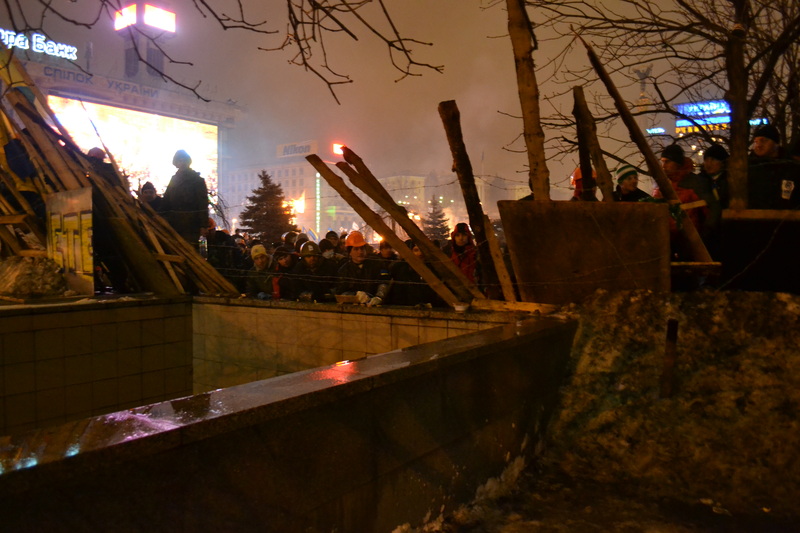 In the earliest hours of Wednesday morning, I watched (on internet live streams…) police storm into the barricades surrounding Maidan and attempt to break down the tents — and they failed. By Thursday, the next time I visited Maidan, there were more barricades — this time built with snow, benches, sand, and anything else people could find — and there were more tents. The tents, by the way, are nailed into the street. People sleep outside in the tents, some of which have generators, and some of which just have a barrel with a fire for warmth nearby. Others sleep in the occupied City Hall, which has been threatened numerous times but has not thus far seen a direct attack. The ground floor features bathrooms, information, and kitchens (which are set up in the coat rooms! ), and the second floor is a giant sleeping platform for hundreds of tired protesters (at least, at 5 a.m. they’re all sleeping…). There are banners from parties and from non-party organizations hung around the room, and medical services and even a psychologist are available for free. Once a day, the building is closed for “sanitary hour,” when volunteers clean up after themselves. Policing and security volunteers have instituted a policy to check identification before letting just anyone enter the building (this follows an accusation that some city documents were stolen). In other words, this works like a well-oiled — and well-policed — machine. When occupiers understood that there would be a raid on the square last Wednesday, they attempted to evacuate all women and children, and those who did not leave were gathered near the main stage to be surrounded and protected by their male counterparts. Now, the barricades are closed at night and columns of men stand behind them at the ready in case of a surprise attack. Small entrances and exits are policed by more volunteers, who reject drunk people and anyone they think might be “provocators” or “Titushky” — someone who just wants to cause trouble. Women remain mostly unseen at night, except in the kitchens and in other behind-the-scenes tasks. 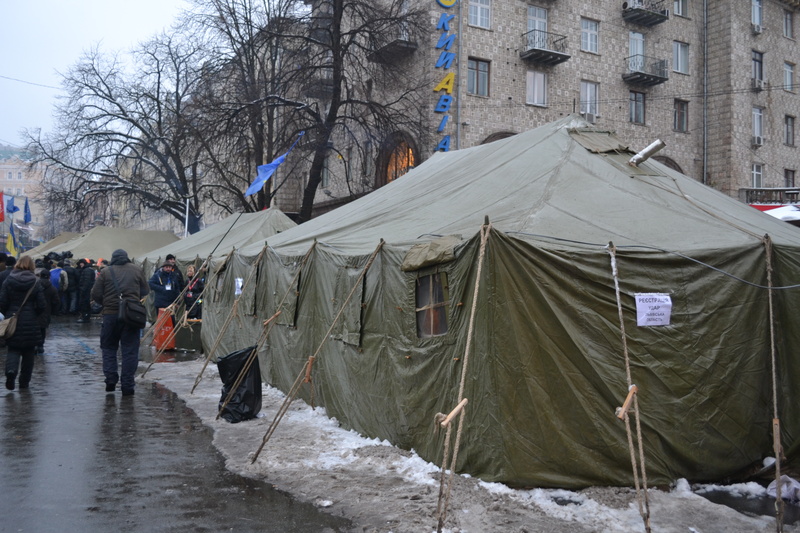 In other words, providing people with round-the-clock support — food and tea, warm clothes, entertainment and political speeches, warm-ish places to sleep, and clean-ish bathrooms — and banning alcohol and suspicious people are what keep Maidan occupied. Companionship helps keep spirits up, as people stay up all night around a fire, drinking tea and eating cold sandwiches. But for how long? And to what end? 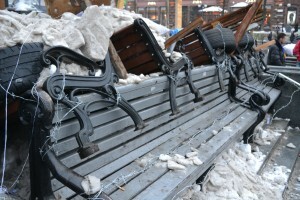 It seems like there are no answers to these questions, but people remain on Maidan. 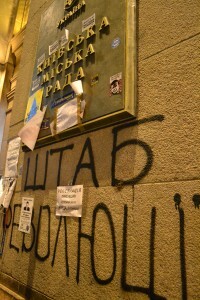 About 5k Ukrainians protest at Mezhygirya – private home of President Viktor Yanukovych.